James Howlett is born into a wealthy Canadian family 22 years ago. Sickly and suffering from a poor immune system, he is home-schooled and sheltered by his parents. At the onset of puberty he accidentally causes his parents' death when his powers manifest during a family argument. Suffering a psychotic break, James is institutionalized and studied. Two years later he is spirited from the hospital by individuals impersonating extended family members, he is imprisoned in a secret government research facility. As one of the few mutants that are active at this point in the world, James is studied in depth and experimented on. The researchers are mandated to attempt to use James as a weapon designed to counter other mutants or intelligence targets. Several years pass. During this time James is repeatedly brainwashed and conditioned to act as an assassin for the government organization. Eventually James is able to break free and escapes into the Rocky mountains. After having evaded or eliminated his pursuers he is recovered by the Hudsons, a vacationing couple in the area. He is taken under their wing and given shelter for the next five years, allowing him to lead as normal a life as is possible for him. James now lives in New York city, still staying in touch with his adopted family but attempting to build his own life as well. James has a certain kinship with nature, with the wild more animalistic side of his humanity. It first became evident the night where he lost control of himself while witnessing his parents fighting with each other. It came more and more to the fore when he was forced to look inwards for his survival while being incarcerated/tortured/experimented upon. When the Hudsons discovered him he was almost entirely feral. It was only through their kindness that he was able to find himself again. Now, James has more control of himself. But the wild and edged side of him is always there quietly seething under the surface. Because of what he's experienced in life, James is not one that is easily approachable. Nor is he one to trust quickly. After what happened with is parents and then the lost years of being tormented, James tends to hold himself aloof in part to protect himself… but as well to protect those around him. That is not to say that he does not find friendship and camraderie to be something he's adverse to. It's more that he's more likely to be suspicious of an individual's motives before offering them trust in kind. Perhaps as some scrap or remnant of his upbringing, James tries to consider himself honorable. He attempts to behave in a manner that he would feel is a higher standard than that which would be easier and more convenient. So he has created this higher standard for himself, a code of honor that's his own and brought about by the fear of letting himself slip into a darker and more negative world view. He is in essence attempting to hang onto his humanity because to do otherwise would be to make it so those who tormented him those years ago had won. So if James gives someone his word, he tends to try and hold to it even at extreme personal cost to himself. If he is given a task by someone he respects then he attempts to move hell and high water to try and fulfill their expectations. The primary factor that has been pushing James forward through his life has been survival. In the past he's been so reduced, so damaged, and so crippled in all states of the word that he's left with nothing beyond simple survival. He has in the past been focused on simply trying to make sure that his next breath is not his last. This has warped his psyche as it's developed so much so that he's become a rather anti-social individual who is at times slow to trust. Yet it has also done him an element of good. Having been so reduced to such a state it has allowed him to try and rebuild. What is more he is trying to rebuild himself as he wants to be. In his mind he has a sort of ideal individual that he wishes to strive towards. It is not just enough to survive. It is not enough to simply be an animal. He wishes to recapture his humanity and insure that it is not simply a mask that he wears in between bouts of wildness. As a young man in his early twenties, James only has a few goals in mind. He views life, a normal life, as something that is almost beyond his reach. Simple things that most people take for granted, James longs for. He came to New York at first on a tip from the vocational school in Jersey, and now with a job he wishes to simply… build a life. Perhaps he'll be able to have friends, loved ones, and hopefully those loved ones won't be endangered simply by being around him. Yet on another level there's a darker motivation. Perhaps on a level that James won't even acknowledge to himself. Part of him that wants to find out what happened in his past. But what is more that part of him wants to make those who are responsible pay. James is gifted with several heightened senses. His sight, hearing, and smell are all enhanced beyond normal means. He is capable of seeing much further with greater acuity than a normal human, almost twice as effective. He is able to hear quiet sounds further away as well as differentiate between familiar and unfamiliar ones with ease. But it is his sense of smell that is the most powerful. He is able to track a target by their smell even in exceedingly difficult conditions. He can differentiate the layered scents in an area and isolate the one he is looking for. He is also capable of using his enhanced hearing and sense of smell to the effect of a makeshift lie-detector, letting him gauge someone's mental state simply by observing their manner, listening to their heart, and smelling the scents they give off. James has an enhanced ability to recover from illness and injury. When moderately injured it usually takes him only a few moments to recover from the damage. The more severe the injury the longer it takes. During his time in captivity the extent of this power was explored in depth. He was able to recover from the loss of an eye, the flaying of his flesh, and the loss of a limb. Though the latter took over a week to grow back. It was his healing factor that made him a candidate for the introduction of adamantium into his system. As a side effect of his healing factor, James is also almost incapable of becoming fatigued. 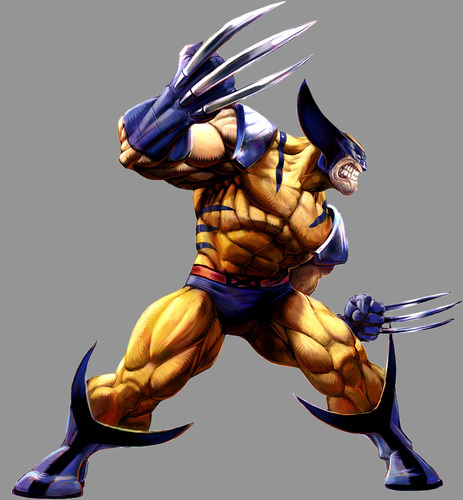 His healing factor counters the toxins generated by his musculature and in turn cleanses his system. This also allows him to endure moderate doses of the most lethal poisons in the world, though larger doses do affect him if not kill him. He does still feel pain, however, and so the healing is not a pleasant experience. James' primary mutation is his altered skeletal structure. At first glance of an X-ray detailing his body, it will become clear rather quickly to anyone with even a passing familiarity with anatomy that James is not a typical human being. The most minor difference being that several of the teeth in his mouth are longer and more pointed than a normal human's. These fangs are not terribly obvious unless James should smile in a particular way, but they are definitely out of the ordinary and perhaps disconcerting. The main difference in his skeletal structure, however, is that housed within his forearms are three seperate bones connected with strong muscle tissue to the longer more mundane bones there. These three bones can be pushed forward with the flexing of those forearm muscles causing them to burst forth from between his knuckles to be revealed as a form of claws. These claws (though currently laced with adamantium) are composed of a dense pointed and edged bone as opposed to the normal material of animal claws. Each time he extends them the claws thrust through the flesh of his knuckles causing pain as well as a small injury that is rapidly healed. Perhaps due to his healing factor or perhaps simply another mutation, James has an enhanced muscular system and physique that gives him greater abilities than a normal human being. He is strong enough to lift 1500 pounds with ease. He can move as quickly as an olympic sprinter despite the extra weight he carries around from his skeleton. He also has powerful reflexes that allow him to react and respond with a blur of motion that would be confounding to a normal individual. At this point in James' life, the only people he really trusts are the Hudsons, Jennifer and James Hudson. They were able to calm the wild and barely aware young man that confronted them in the Rocky Mountains. They went out of their way to see that James was looked after and cared for, becoming in essence his surrogate family. They're his only lifeline to the world in essence, and he feels a great debt to them. It's likely that if they ever needed his help that he would give it to them, and the reverse is just as likely. The Hudsons have the resources of a moderately successful professional family in New York state. When he was captured and experimented on, the government agency tried many ways to try and capitalize on James' mutation. The young man was almost unkillable in various ways, but he was not unstoppable. He represented a threat, but conventional means could still counter him. The scientists behind the research came up with the idea of augmenting this young man in a way that only he would be able to recover from. They chose to line his skeleton with the rare metal, adamantium. With his healing factor keeping him alive, the scientists were able to inject his body with the liquid metal and coat his bones with the substance. At first his body sought to reject the material, but his healing factor became reconciled with its presence. The end result of this injection has made it so that his bones are impossible to be broken by almost any amount of pressure available on the planet. Also the metal lining his claws has given them an edge that allows them to cut through any weaker material… which is just about anything. Force fields are still able to block the blades, and Vibranium is a suitable counter, but there are few things otherwise that can halt them. After regaining himself upon his escape from the laboratory, James lashed around for something to keep his attention and let him focus. He found that he had the rather typical young man's infatuation with cars and motorcycles. Anything that goes reasonably fast, James is drawn to it. He's not exactly what you'd call a stunt driver, but he's definitely been around those vehicles more than the average person and is able to drive them decently well. So much so that in his past he's been known to win a race or two, not entirely legal ones at that. When someone becomes infatuated with fast cars and motorcycles their interests tend to move in the way of keeping those vehicles up and repaired. James, after returning to school, leaned naturally in the direction of vocational training in the field of automobile and motorcycle repair. He took several years of classes and then followed up on his education with his own employment at several garages. The end result being that he's quite able to maintain and repair most common and uncommon vehicles, even perhaps able to finagle out the more difficult and obscure problems. He has a level of knowledge in this field that he'd most likely be able to make a living at it into perpetuity. Perhaps his talent of being stealthy is in part due to his kinship with the wild creatures of nature, or perhaps it was in part some of the training he was exposed to during the time he was incarcerated. Whatever the case may be, James has the talent and knowledge to be able to move quietly when it's needed. He is able to choose his path and footsteps well enough that unless someone is alerted and looking out for him in the proper direction, it's likely that he'll be able to close the distance with an individual without being noticed. This ability also comes more easily to him when he's in the wilds of nature, but is not useless to him outside of that setting. Aided by his enahnced senses, James is what one could only call an exceedingly gifted tracker. He can differentiate between scents and markings of various quarries, tracking them through a variety of terrain, and is able to choose the right moment when to best come upon them. With his knowledge he's also able to follow his target at a distance without them knowing unless their talent is akin to his level as well. It would take a situation extremely out of the ordinary or with some unknown factor to make it so that James would not be able to track someone or something in a situation. During his time incarcerated by the government agency, James was given some training in combat for when it was needed. His training was not extensive in this capacity, perhaps due to the fact that the agency felt he did best when allowed to attack his target like a wild animal. So James is quite capable of mixing it up with the best of them. But he has little rational thought to his style. He is all wildness, intensity, bravado. There is no finesse and what is more there is no skill. He is more of a match for a mass of untrained or only moderately trained individuals. But if someone is able to endure his wild furious attacks and has more training than him, then it's feasible they could find a way to defeat him. If you were trapped out in the wild, in any harsh locale in the world, there are few people better to have at your side helping you survive than James. Due to his connection with nature, his heightened senses, as well as his elaborate knowledge about the wilderness… James is capable of surviving years at a time in the wilds of the world. He is able to find water in the most barren places. He is able to procure food no matter how thin the apparent selections of protein may be. He can provide shelter, or create fire with little else save what is provided by nature itself. The Agency, while experimenting on James found that if they injected in him a heavy amount of Carbonadium that it would interfere with his healing factor. He would still recover from the injuries inflicted upon him, but they would take much longer to heal. The plan that the Agency had for using James as an assassin and weapon was based primarily upon the application of a trigger scent. During an operation another agent would enter the area ahead of James. That agent would mark the target in some manner with a particular chemical mixture known only to the Agency. James would then be introduced into the area after the first agent was extracted. Upon gaining proximity with the target, the chemical mixture would act as a trigger scent for him. Upon smelling the trigger, James would lose all self-awareness and become in essence a wild animal in a berserker fury that must kill whomever or whatever had the trigger scent upon it. He would then escape the scene, the scent would wear off, and then he was to be recovered. Luckily James was able to escape before the plan was ever enacted, but he is still vulnerable to the trigger scent if it ever comes into play. Being such a primal individual, it is difficult for James to maintain control when he becomes overly angry or is subjected to the rigors of mortal combat. If he is horribly injured, someone dear to him is in danger, or someone deliberately is able to infuriate him, it is possible that James would lose control and revert to his berserker state. At such a point it is difficult for him to differentiate between friend and enemy. Perhaps the loss of memory that James has suffered is due to brainwashing. Or perhaps the loss was caused by suppressed traumatic events. Whatever the case may be, James has very little memory of the first seventeen years of his life. Any hint of them or casting of his thoughts back towards that time results in simply sense flashes of memory involving pain, intense emotions, and utter discomfort. So much so that he does not care to at all. Sometimes something may trigger some form of sense memory and he'll latch onto it, but then his mind will rebel and he drops the thread as quickly as he gained it. From somewhere in James' past he's developed a measure of affection for women with red hair. It could be an old acquaintance or family member that makes the sub-conscious connection in his mind. Or it could be simple infatuation with the color or the temper that it signifies. Whatever it may be, James is definitely more open to being manipulated by an attractive redhead. Not that he suddenly loses all focus and control, moreso simply that his normal aloof and stand-offish facade is easily broken by the smile of just such a lass. Even though James escaped the facility that housed him for many years, most likely eliminating most of the staff in his departure, the leaders of that research initiative are not all dead. On some levels in the government, James is most likely still known and sought after for his role in the massacre as well as his position as a weapon that cost a great deal of money to those that created it. Luckily the government agency operates in the shadows so the police and military are not seeking him. But if one of the agency's operatives is able to get intel on James' whereabouts it's not infeasible that they'd be able to turn local law enforcement on him and a manhunt could ensue.